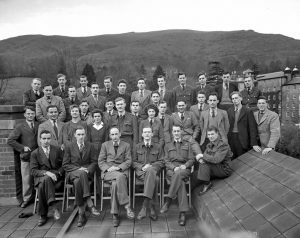 A surprisingly large number of young men who were at TRE during the Second World War had eminent post-war careers. Amongst them was Bernard Lovell (later Sir Bernard Lovell) who was the originator of the Jodrell Bank Radio Telescope. He was directed by the Government to work at TRE and its predecessor establishments from 1939-1945. On his arrival at Bawdsey Research Station (the first dedicated radar research establishment) he was assigned to work on airborne radar which was then in its infancy. The immediate task was to design a radar to enable a fighter to detect and attack another aircraft. 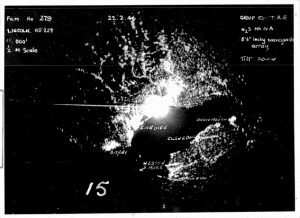 A major problem was that some of the transmitted radar signals intended to be reflected by a target aircraft were also reflected by the ground. By means of a dedicated experimental flight in 1941, Lovell showed that these ground signals could also be electronically processed to identify ground surface features and thus provide a means of aerial navigation. He named his experiment ‘Blind Navigation’ (BN). BN became a major TRE research effort to design a ground mapping radar which would provide a bomber aircraft with an autonomous system for navigation. In just over a year, a purpose-designed navigational radar system – now code-named ‘H2S’ – had been designed, built, and test flown in April 1942. Winston Churchill gave it the highest development priority. There were huge development problems, but 13 RAF Stirling and Halifax bombers first used it to attack Hamburg on 31st January 1943. There was a conflict between the Bomber and Coastal Command as to who should get priority for the new radar. The Bombers won but in the end, a variant of H2S, Air to Surface Vessel (ASV) was fitted to Coastal Command aircraft and this in conjunction with the Leigh light resulted in a massive increase of submarines been sunk just in time to reduce the critical food shortages In a programme managed by Lovell, the radars was continuously improved, reaching H2S Mark 3 in RAF service by the end of the Second War, and further development continued at TRE beyond the War’s end. A 1944 proposal by a top level Government scientific committee advocating the development of British nuclear weapons had been accepted, so an aircraft to deliver them was necessary. The contemporary availability of the new jet engine revolutionised aircraft performance and design, and a 1946 specification from the RAF resulted in aircraft manufacturers’ proposals for the ‘V-bombers’ – the Vickers Valiant, the Handley Page Victor, and the Avro Vulcan. All three aircraft types were accepted for development with common navigation and bombing systems; H2S was judged to be suited to the job and was further developed into H2S Mark 9A. Compared with their Second World War predecessors, the greatly increased performance of the new aircraft required a much improved navigation system and new, or improved, supplementary navigation equipments were also introduced. They were the True Airspeed Unit, Green Satin Doppler Radar (developed from TRE work on a radar to measure groundspeed and drift), Ground Position Indicator Mk 4, and an analogue electro-mechanical computer marvel called the Navigation and Bombing Computer (NBC): these equipments, plus H2S Mk 9A, were known as the Navigation and Bombing System (NBS). 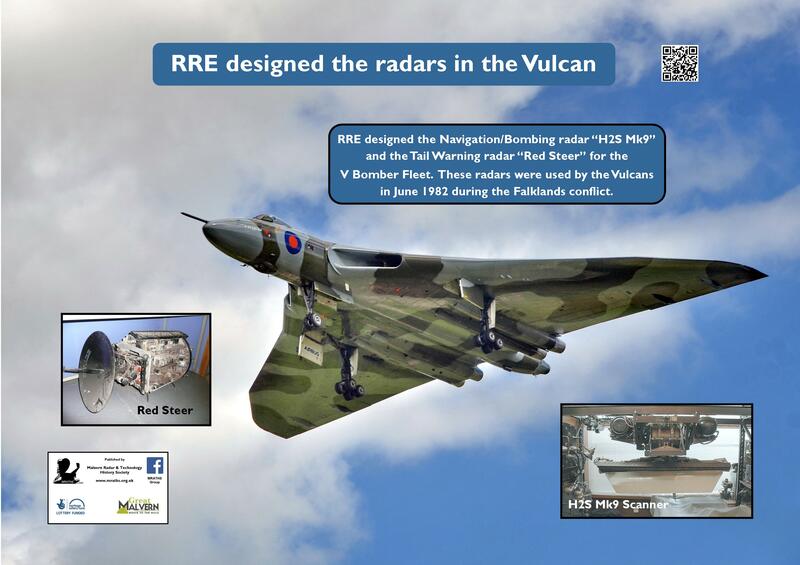 In the Vulcan, the 6ft-wide H2S radar scanner was housed underneath the lower black portion (the ‘radome’) of the aircraft’s nose, and similarly for the other ‘Vs’. H2S remained at the heart of NBS and the radar saw continual RAF service for over 50 years, ended by the retirement of Victors in October 1993. The V-bombers dropped bombs in only two conflicts – Valiants in the Suez Crisis (RAF Operation Musketeer) during October/November 1956 and Vulcans in the Falklands campaign (RAF Operation Black Buck) during April – June 1982. During World War 2, a rear gunner in his gun turret protected RAF heavy bombers from rear attack by fighters. The streamlined shape of the V-bombers precluded the incorporation of a bulky rear gun turret, so their self-protection comprised a rear-facing radar to detect a pursuing fighter and ECM (electronic countermeasures aka jammers) to render that fighter’s radar ineffective. In fact, the class of radar required for ‘tail-warning’ was the same as was needed by an intercepting fighter. Initially, a TRE-developed tail-warning radar (TWR) code-named Orange Putter was fitted to all three V-bombers. Once the ‘Vs’ entered service (Valiant in January1955, Vulcan in September 1956, Victor in November 1957) increasing RAF experience in training exercises showed that the radar’s performance was too limited. In the early-1950s, RRE was designing a Aircraft Interception (AI) radar for the lightning a new fighters, however in the end this radar was not used, and it became ‘a radar looking for a job’. Perversely, it was seen that by switching the radar’s originally intended location in the fuselage nose of an aircraft (Lightning), to the fuselage tail end of an aircraft (V-bomber), it could function as a high-performance Tail Warning Radar (TWR) to replace Orange Putter. Flight trials in a specially modified Valiant proved the case. It was the only Valiant to carry AI 20 (now code-named Red Steer after its well-known RRE Project Officer, Gerry Steer). However, from 1960, the tail-end of previously built Victors and Vulcans, and all new-build aircraft of the two types, was greatly enlarged to carry both Red Steer and a wider range of improved ECM. An improved Red Steer Mk 2 was fitted to Vulcans in the mid-1960s (it is the version shown in the inset photo in the poster).